Why is the fish popularly called "walleye"? Its eyes point outwards, and the shine that come off these eyes in the dusky dark is believed to give this fish away to fishers at night when the fish does it major feeding. This "eyeshine feature" is an advantage in other circumstances - it enables the fish to see better in low light conditions or in cloudy troubled waters where it can also feed during the day. The walleye is a fish eater, with a real interest in yellow perch which have trouble seeing as well at night. Native to Canada and the United States, sometimes this fish is called walleyed pike, coloured pike, yellow pike or pickerel even though pikes are members of a different family. Olive and gold with a white belly and a large mouth full of many sharp teeth, this fish has a paired fin on its top back side - one spiny fin and the other soft. It has a kind of truncated back fin. 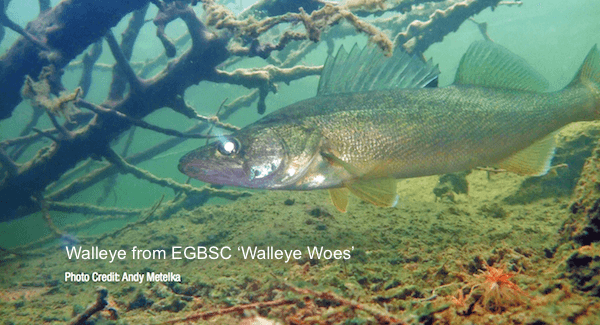 Walleyes are very similar to sauger fish ( Sander canadensis), which so far has not appeared as a species found in this project and seems to have a much more limited distribution. The differences are in the tail fin of walleye - it has a little white on the lower part and an absence of rows of black dots. According to the Eastern Georgian Bay Stewardship Council's (EGBSC) Walleye Woes, "most Georgian Bay Walleye stocks have collapsed to a small remnant of their former population." Over-fishing being the main culprit, but also "from water flow manipulation in spawning rivers, dam construction, past logging practices and the introduction of numerous invasive species." EGBSC recommends fishing for other species like smallmouth bass, or at the least - catch and release walleye to help protect this precious fish. "There is a need to reduce Walleye harvest." Walleye Woes is a good fast read that provides great tips on how you can catch and release effectively and other initiatives you can do to help this fish species survive in Georgian Bay. What is Georgian Bay forever doing for Walleye? With your support, we are helping the Eastern Georgian Bay Stewardship Council assess spawning habitat in 8 Georgian Bay tributaries which will aid in prioritizing habitats for remediation. Please find more detailed information on this project at this link, Bringing hope to eastern Georgian Bay fish.